What Do You Need To Know About Open Enrollment? In essays by patients and colleagues, three nurses were honored for their generosity and life-changing compassion. 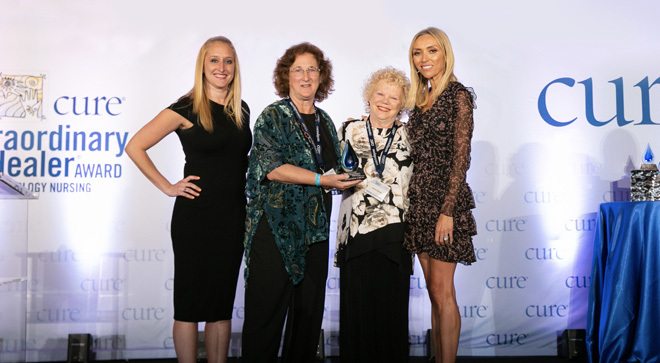 Generosity was the thread that tied together three oncology nurses honored in CURE®’s 2019 Extraordinary Healer contest. Two finalists and a winner were recognized for giving more time and effort than their jobs demanded to support their patients, colleagues and institutions. In essays by patients, colleagues or family members, these nurses and 51 others were cited for going above and beyond the line of duty by offering life-changing compassion, expertise and helpfulness. Before an audience of 1,000, Caitlin Cohen, M.S.N., RN, CPNP-AC, CPHON, a nurse practitioner at the University of Chicago Medicine Comer Children’s Hospital, in Illinois, was named the winner. The announcement came during a dinner and ceremony in Anaheim, California, held in conjunction with the Oncology Nursing Society (ONS) 44th Annual Congress. The event featured a keynote address by Giuliana Rancic, an entertainment journalist, author, entrepreneur, fashion designer and beauty expert and a survivor of breast cancer. As a nurse practitioner for children facing bone marrow transplants, Cohen supports and advocates for patients and their families. 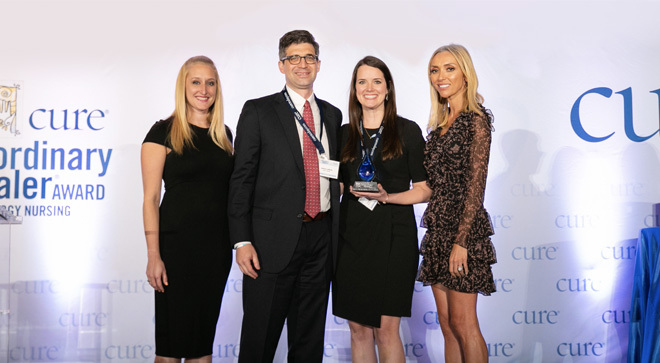 Caitlin Cohen, M.S.N., RN, CPNP-AC, CPHON, (second from right) was named the winner of CURE®’s 2019 Extraordinary Healer award. Photo by Christopher Todd Studios. At the Extraordinary Healer event, her fellow oncology nurses were moved by stories of how she went above and beyond for those patients. In one case, she provided high-calorie protein and vitamin drinks for a malnourished young man with graft-versus-host disease whose mother was having trouble affording food — all the while letting the family think the hospital was providing the supplements. In another example, Cohen spent a lot of extra time over a period of six months lending a supportive ear to a patient whose depression and anxiety made it difficult for her to cope with a bone marrow transplant. Finally, Cohen became an integral support for one family that suffered a lot of loss in a short period of time, taking time outside of her work hours to be there for them. Cohen and her guest will receive a weekend for two at the Nobu Eden Roc Beach Resort and Spa in Miami Beach, Florida, including air travel, meals and a spa treatment. The essay about her will be featured in an upcoming issue of CURE®. Also honored during the ceremony were two finalists. Barbara Bittner, RN, OCN, of AdventHealth in New Smyrna Beach, Florida, and Charlene’s Dream in Daytona Beach, Florida, was recognized for her efforts as a volunteer while continuing to put her patients first in her job as a nurse navigator. Bittner was a founding member of Charlene’s Dream, a nonprofit organization formed in 2015 to provide education and support to local women with cancer. It was founded in honor of fellow nurse navigator Charlene Brady, who died of cancer but had envisioned such a facility. Bittner was praised for running an arts therapy group there for a year, and then a satellite support group. For a while, her nominator pointed out, she was regularly driving 25 miles out of her way to pick up a support group member who needed transportation to meetings. Angela Hammack, B.S.N., RN, OCN, a charge nurse and clinical educator with Jackson Oncology Associates in Jackson, Mississippi, was cited for turning her passion for running into a way to honor those she takes care of and raise over $100,000 for cancer research and patient support. In one instance in 2017, she trained for five months to run a 100-mile course, which she completed in 29 hours, 36 minutes and 2 seconds. Hammack works to support the Hope House of Hospitality, which provides a place for those who travel for treatment; the Cancer League of Jackson, which raises money for the American Cancer Society; Susan G. Komen; and the American Lung Association. She has worked on oncology legislation at the national and state levels, including helping with the passage of an oral parity law. Angela Hammack, B.S.N., RN, OCN, (second from left) was cited for turning her passion for running into a way to honor those she takes care of and raise over $100,000 for cancer research and patient support. Photo by Christopher Todd Studios. Michael J. Hennessy, Jr., president of CURE® Media Group, said the event is one of his favorites because it recognizes “so many passionate people who truly care about what they do and the patients they affect daily.” Having accompanied his mother to chemotherapy treatments, he added, he’s witnessed the fact that oncology nurses listen, care and are nurturing and patient. 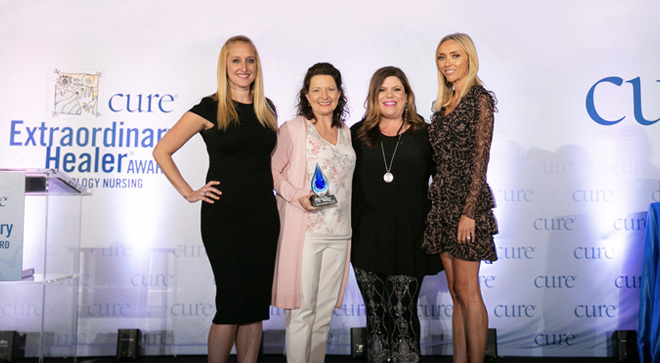 “You are all extraordinary healers, and we want to recognize each and every one of you, your colleagues and your peers,” added event hostess Kristie L. Kahl, associate editorial director for CURE® and its sister publication Oncology Nursing News. Rancic, known as a solo anchor and managing editor for TV’s “E! News,” discussed her cancer journey, which started as she faced infertility. While embarking on a third round of in vitro fertilization in 2011, a nurse named Kelly told Rancic she needed to have a mammogram — even though she was 36, had no family history of breast cancer and was healthy. The reason was that, in case she had estrogen-driven breast cancer, pregnancy could fuel the disease. Soon thereafter, Rancic was shocked to learn she had exactly that disease. After a lumpectomy failed to remove all the cancerous tissue, she opted for a bilateral mastectomy — after which she and her husband had a son with the help of a surrogate. Without Kelly, Rancic said, she doesn’t know if she’d be alive today. Rancic recalled an oncology nurse, Jessica, who caught her trying to flee the hospital as she waited to hear if she had cancer. Jessica calmed her down and stayed with her until she received the diagnosis. The nurse also gave Rancic useful advice by encouraging her to think of questions she wanted to ask the oncologist and bring them in writing to her next appointment, so that fear and emotions wouldn’t cause her to forget them. Since then, Rancic has shared that same advice with thousands of women. Rancic, who is now seven years cancer-free, created Fab-U-Wish in 2013. It’s a program to grant fashion, beauty and celebrity-themed wishes to women battling breast cancer. Her other charitable initiatives include helping to support The Pink Agenda and the Breast Cancer Research Foundation. Cohen and Bittner were nominated by colleagues, while Hammack was nominated by a caregiver — the daughter of one of her patients. The three joined more than 1,000 nurses nominated since the inception of the Extraordinary Healer Award for Oncology Nursing in 2007. 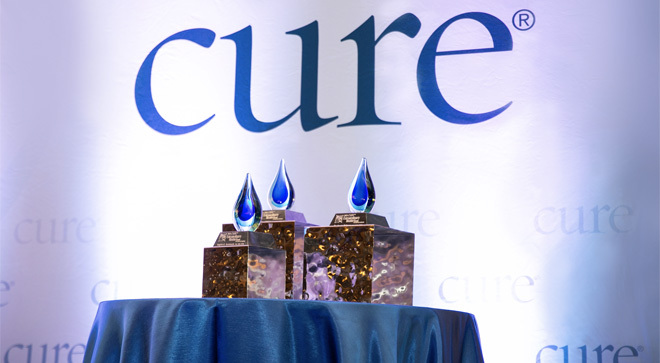 Finalists and essayists honored have included men and women, adults and children, representing a variety of cancer centers and hospitals in a host of states. Last night, each nominee took the stage with her nominator, who then read her essay aloud. Cohen was nominated by James LaBelle, M.D., Ph.D., also from Comer Children’s Hospital. Bittner was nominated by Dianne Rohald, a colleague at both AdventHealth and Charlene’s Dream. “If you Google ‘team player,’ you will find descriptions such as the following: someone who adapts quickly to new situations, avoids office politics, focuses on team goals, appreciates others’ work styles and celebrates peers’ successes,” Rohald wrote. “These all perfectly describe Barb. Barbara Bittner, RN, OCN, (second from left) of AdventHealth was recognized for her efforts as a volunteer while continuing to put her patients first in her job as a nurse navigator. Photo by Christopher Todd Studios. Hammack was nominated by Cora Beth Hartfield. The event was sponsored by the pharmaceutical companies Bristol-Myers Squibb, Amgen and Janssen. Speaking on behalf of Bristol-Myers Squibb was Jacqueline Smith, associate director of U.S. oncology advocacy and policy and a melanoma survivor. Smith looked back on the help her oncology nurses gave her after a diagnosis of melanoma in her college undergraduate days and a recurrence four years later when she was in graduate school. She remembered nurses seeing her through difficult side effects; wiping her tears in tough times; celebrating victories; encouraging her to have hope and pursue her dreams; and being tough with her when she wanted to ignore medical advice. Photo by Christopher Todd Studios. The evening included a tribute to the late Kathryn West, M.S.N., RN, OCN, an oncology nurse who served as advocacy director at Amgen and died last year of colorectal cancer at age 55. She played a pivotal role in the launch and success of Amgen’s Breakaway from Cancer program, which shares resources with patients from prevention through survivorship, and was instrumental in attracting actor Patrick Dempsey as one of its ambassadors. The actor said that his Dempsey Center in Maine, which provides supplementary cancer services for free, would not have existed without West’s support.